CBR600 -2000 and maybe older ones, item 210B. 636 Included X-adapters should be used. ZX1000RR all year models, Included X-adapters should be used. RC8 2010 and newer, item 210B. GSXR600 96-2000 special instructions, FI light will come on. FI light will come on, item 210B. 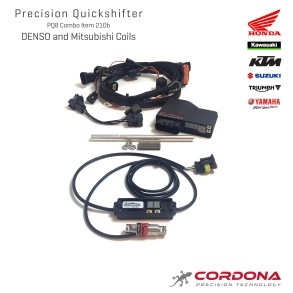 Daytona 675, all year models with stick coils, Included X-adapters should be used. 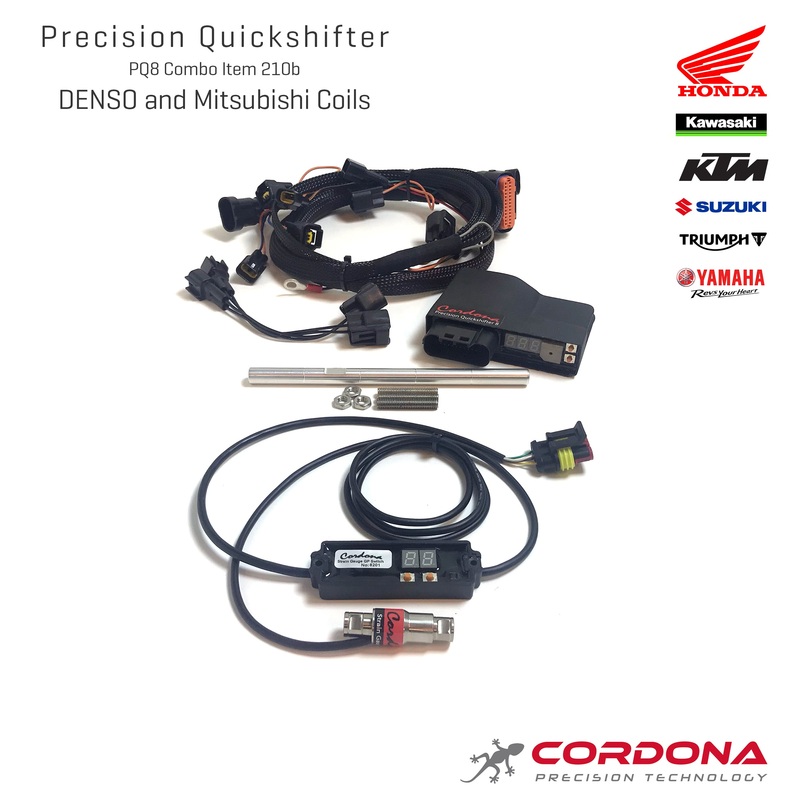 Daytona 675 -2009 and newer, 210B will provide smoother and more precise up shifts than item 406 connected to stock ECU. Street Triple R, all year models with stick coils, Included X-adapters should be used. Street triple R -2009 and newer, 210B will provide smoother and more precise up shifts than item 406 connected to stock ECU. Speed Triple, all year models with stock coils, included X-adapters should be used. 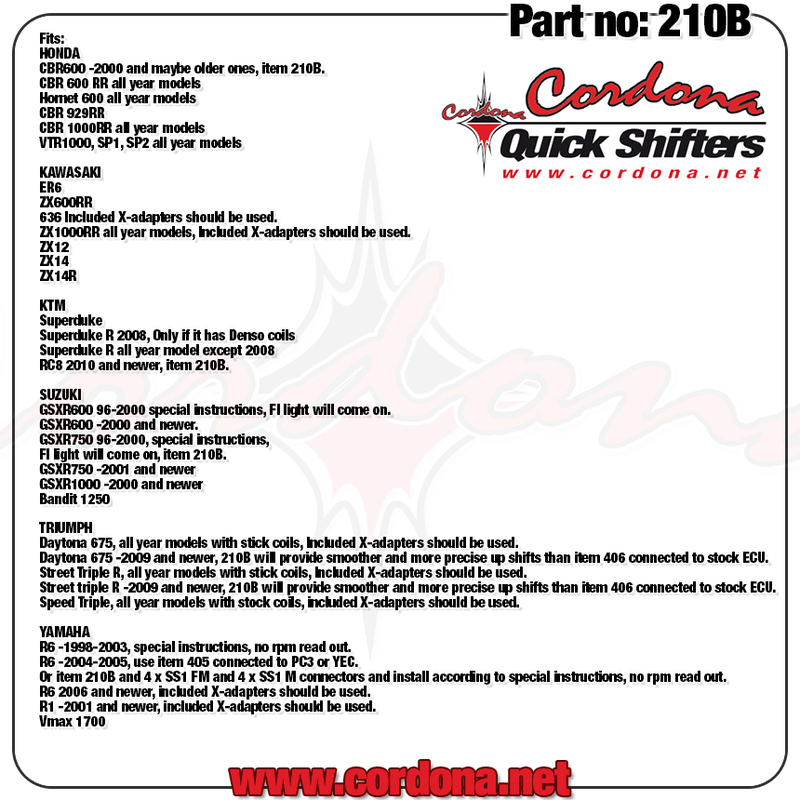 R6 -1998-2003, special instructions, no rpm read out. R6 -2004-2005, use item 405 connected to PC3 or YEC. Or item 210B and 4 x SS1 FM and 4 x SS1 M connectors and install according to special instructions, no rpm read out. R6 2006 and newer, included X-adapters should be used. R1 -2001 and newer, included X-adapters should be used.